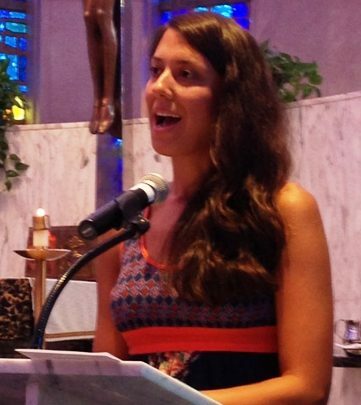 RMC Alumni Mary Clare Weiner (2014-15) shares her reflections on 2015 with us. Mary Clare currently works as a nurse in North Carolina. As a new year starts, I reflect on the twists, turns and sprinklings of grace that have been my past year. I moved back from Philadelphia at the end of July and started working in North Carolina in August. The further removed I am from my year of service, the more I come to appreciate the role it played in my life. It gave me a year to grow in community with amazing women and to see how respect, simplicity, and kindness of heart can foster a true sense of joy and belonging. I also grew in my ability to trust in God’s plan for me. I remember the anxiety I experienced as I applied for jobs at the end of my year as an RMC. When I got the interview offer in North Carolina, I was very much torn between this opportunity and those that may have lived in my home city. I remember taking a break from replying to emails and getting ready for my interview to go on a run. After my run, I was sitting in the sand at the beach, watching the sun go down. I closed all of the applications on my phone so that I could sit in silence for a while. Despite closing all of my apps, music continued to play on my phone. I checked to see if all of the apps were closed on my phone – they were. I was tempted to turn my phone off to see if this would fix the problem, but on a whim, I decided to listen to the music, just in case it was playing for a reason. Just listen to what I’m whispering to your heart. I felt at peace and I walked back to the house my family was staying at on vacation. I decided to place my worries in God’s hands for now and enjoy the rest of my vacation. The next Monday, I went to an interview and accepted a job on Wednesday. It really wasn’t what I had expected to be the next chapter of my life. I thought I would be in my home city right now. Looking back after five months spent working and living in North Carolina, I realize how much God knows what he’s doing. I have learned so much as a nurse and I am working in an environment that is supportive and full of new opportunities. There are also small ways that I have seen God’s grace since being here. When I was in Nursing school, I switched a clinical assignment so that I could work within a prison setting. The clinical ended up not working out, and I found myself doing my final clinical at the hospital at which I now work. At the time, I was upset. I really thought that I was supposed to be working at a prison, and this change in plans made me doubt that God really has any plan at all – dramatic as that may sound. Now, I laugh at this because I would not be working where I am today had I not switched my clinical! I am also about to begin volunteering at the medical center at the prison that I originally would have completed my clinical. To top it off, in my interview for the volunteer position at the prison I learned that the woman interviewing me used to work where I volunteered as an RMC! I just see God sitting in heaven, smiling at how He plans things out. Now I am beginning to look into my future and ask the same questions that I always do: what’s next, when will this, that or the other thing happen in my life. I hope as I go into this New Year that I can walk in trust that God knows what he’s doing. When I have placed my heart and will in His hands, the outcome is always surprising, to say the least, and glorious, to say the truth. I hope that others who are reading this can also lean into trust a little more in this coming year. It is a beautiful place to be.